The 3 inch toothpick is often called a Texas, Baby, Tiny, or Small Toothpick. (Standard toothpicks are normally 4 to 4.25 inches long when closed and large toothpicks are normally 5 inches or more when closed.) I’m fairly certain the term Texas Toothpick is W.R. Case & Son trademark. As I have seen the 3 inch variety described so many ways not only by knife collectors but also within the literature presented by Rough Rider, I am going to use the generic term 3 inch when describing the Rough Rider toothpicks of this approximate size. This review does not cover the standard, two inch, or five inch toothpicks also made by Rough Rider. To date, I own eight Rough Rider Toothpicks. As this is not a pattern I normally collect, it is a very slow growing collection. For me, the 3 inch toothpick is falls into the category of Gentleman’s knife. It really has very few practical uses but it does look nice with a suit. As such, when looking at purchasing 3 inch toothpicks, I tend to look for the more colorful or expensive looking knives. This is apparent when you see the Rough Riders I have bought. The upside of Rough Rider Toothpicks. I think the best thing about Rough Rider Toothpicks is they look expensive but they are not! I’ll leave it up to you to decide which you think is the most handsome of the lot. The overall quality of the build on all the ones I have bought has been exceptional. The thin little blades are extremely sharp and demand respect. The tip is extremely pointy and if a finger is in the way when closing, you will find out just how painful it is cut you r finger with a razor! My only comparison pieces are other Chinese made toothpicks. In every case, the quality of the Rough Rider and its price point make them better options than any other globally produced or imported 3 inch toothpicks. . I have considered buying a Case Texas Toothpick but they typically run four to seven times the price of the Rough Rider. Considering the side by side comparisons of the Case and Rough Rider Peanuts, I’m not prepared to pay that type of money for a Case Texas toothpick. 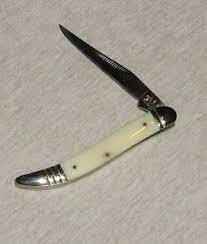 Description: While I never intended to collect tiny toothpicks, I do collect knives with white smooth bone handles. The tiny toothpick seems like a natural for this elegant little gent's knife. Description: The photo does little justice to the dancing colors found in the imitation abalone handles of the tiny toothpick. 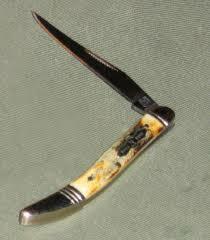 Description: All tortoise shell knives are made with some type of imitation material. The Rough Rider tortoise shell has a nice translucent appearance. It has remained in the line for some time. Description: Rough Rider released the 3 inch Toothpick with the same number on two different occasions. This is the second release. The earlier release has a round RR shield. RR has announced they will no longer make folders with stag handles so these might become hard to find. Description: Unfortunately, the Arrowhead knives are getting harder and harder to come by. Brian Yellowhorse took a lot of criticism for putting his name on this line of knives but the criticism is unjust. The design work is fantastic. He and Brian Wilhoite (who designed the box and may have assisted with other features should be commended for their efforts. The pattern of the imitation rough surface turquoise is based on the Bisbee Blue Turquoise found in Bisbee Arizona. The cast bolsters are based on the worked bolster found on Brian Yellowhorse's custom knives. Description: The Armor Hide Series was released in late 2011 and quickly became a favorite among Rough Rider Collectors. The jigging pattern is said to look like the armor on a Samaria warrior, however, many Rough Rider fans say it reminds them more of an Armadillo. Description: Another pattern released in 2011 or early 2012. It harkens back to the smooth green toothpick bone. These were some of the first knives to get the new bomb shield. Among the three inch family, I would like to see the Christmas Candy Cane, the Blue Smooth Bone used in the Once in Blue Moon series, and Coal Miner toothpick. I also think they should do a series of "Sunday go to Meeting" toothpicks with various initiation and/or semi precious stone handles. They've already got a pretty good start to the line!